Looks like we’ve got six more weeks of winter ahead! Come warm up in our studios while learning to make your own amazing glass art! Making glass is amazing and fun! No experience necessary! Our Sampler is an introduction to the basics of glassmaking in all three of our studios. You’ll make a paperweight in the Hot Glass Studio, several beads in the Flame Studio, and a 6″x6″ glass tile in the Fused Glass Studio. Learn to make your own glass art! Our comprehensive Path to Independence coursework will give you all the knowledge you need to start making your own artwork as an independent artist. We offer small class sizes and provide all the tools necessary to finish your work to perfection. Complete four months (48 class hours) of these courses, and we will certify you to work independently in your preferred studio! You could even start selling your work in our gallery! Available in Glassblowing, Flameworking or Fused Glass. Nothing beats the taste of an ice cold beer when you’re drinking it from a handmade glass! Come create your one-of-a-kind beer stein with the artists in our studios! Spaces fill super fast! Experiences — Available 7 Days a Week! Want to come in and make your own beautiful glass ornament, paperweight, or heart? Our hands-on Experiences are fun for all ages! 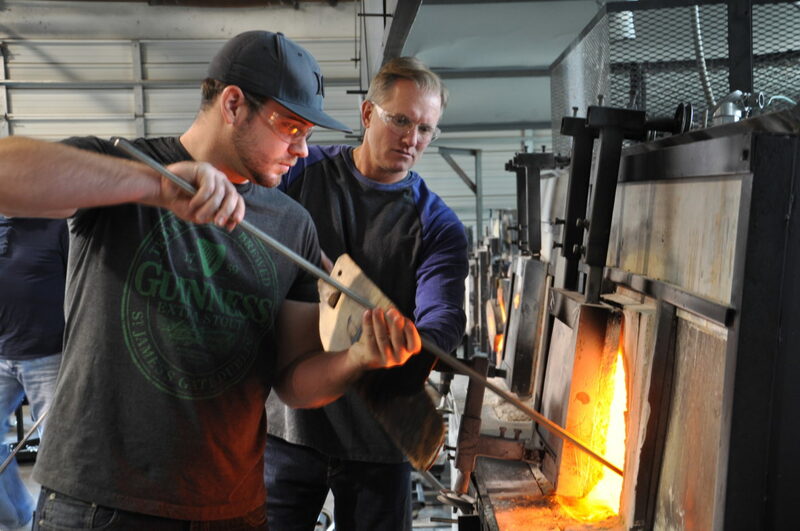 We now offer you the opportunity to book online or simply walk in to get hands-on with molten glass! Experiences are available anytime Monday-Saturday, 10:00a-5:00p & Sunday 11:00a-4:00p. Want to bring a big group? Give us a call at 314.367.4527.